Right now the panel discussion is over and everyone is waiting for the closing keynote by Vik Muniz. 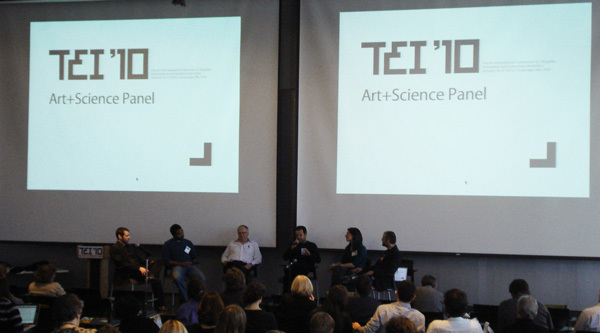 The panel, consisting of John Frazer, Natalie Kuldell, Tavares Strachan and Vik Muniz was interesting in case of the ways of thinking that unites and devides artists and scientists. How do artists think, act and see the world? And how it is with the scientist? Collaborations come up between the two. How do problems occur? How do they get solved? Is there a “common” sense of true, false, beautiful? How do beasty B and beasty A get together? These and other questions are discussed in the panel. For everyone who wants to have the TEI°10 flavour for “to go” or maybe been too dizzy after three days of amazing conference action, can download the audio take of the discussion and re-listen it while travelling home.